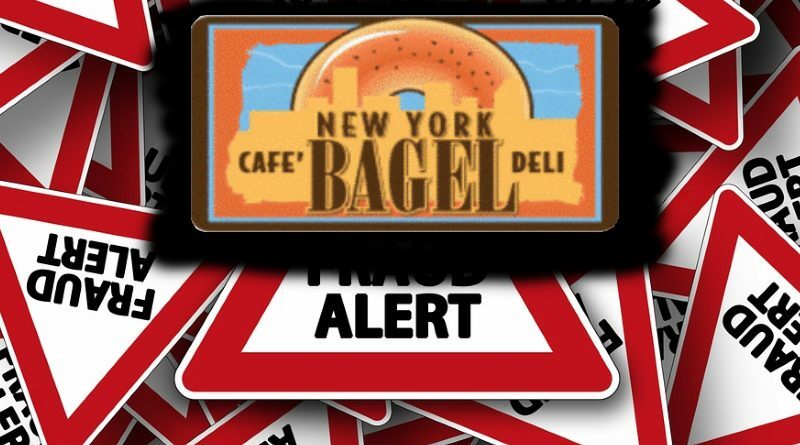 This NY Bagel Café Franchise Scam Overview page provides an index to our ongoing expose of the illicit NY Bagel franchise scheme aka NYC Bagel & Sandwich Shop, our advocacy for NY Bagel franchise victims, and our plea to state and federal law enforcement authorities to stop allowing this company to rob trusting individuals and families. Law enforcement and regulatory agencies are encouraged to use this page as a reference tool for their investigations. (UnhappyFranchisee.Com) In our opinion, two individuals named Joseph Smith and Dennis Mason (who also goes by the name “Keith Samuels” and other aliases), aided and abetted by a network of complicit 3rd parties, are running a lucrative franchise scam by promising trusting individuals the opportunity to join a young, successful franchise chain and own their own bagel café for an upfront fee ranging from $17,500 – $29,500. NY Bagel Café claims that they provide 100% financing for the rest of the approximately $100,000 – $200,000 investment, and that the initial franchise fee is refundable if the franchisee turns out not to be creditworthy. Our research indicates that the vast majority who sign franchise agreements with NY Bagel Café are neither provided funding nor have their initial fees of $17,500 – $29,500 refunded. Dennis Mason & Joe Smith, we believe, simply keep their money, knowing that they can’t afford to hire a lawyer and won’t be able to collect a judgement even if they are awarded one. Those who ARE able to obtain funding and manage to open a NY Bagel Café will likely lose dramatically more than just their franchise fees. Our research indicates that more than 90% of the NY Bagel Café locations that opened have shuttered their doors, and the franchisees’ investments were lost. Despite being provided proof of numerous violations of franchise and business opportunity laws and anti-fraud statutes, so far the Federal Trade Commission (FTC), state franchise regulators, state attorney generals and the FBI have failed to protect citizens from this (in our opinion) predatory scam. NY Bagel Café continues to run deceptive ads on Craig’s List, continues to harvest franchise fees from undercapitalized franchisees, and continues to brag about store openings even in states where they cannot legally sell franchises. NY Bagel Café has provided prospective franchisees with “disclosure documents” that indicate they started franchising in 2012, and have had no closures or terminations. Our research shows that NY Bagel Café has opened and closed more than 30 failed locations… some of them more than once. NY BAGEL CAFÉ SCAM Claims Validated by VA Corporations Commission NEW! Are franchisees being paid to create an illusion of success? 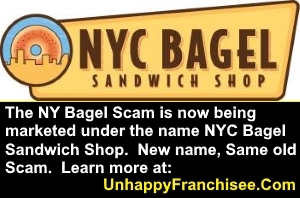 NY Bagel Cafe gives franchisees a list of their 17 “Approved Vendors.” We tried to contact each one and found most of the contacts were no longer reachable and those who were said NY Bagel Cafe prospects were too unqualified for them to finance. Many asked to be taken off the NY Bagel Lender List. Our one small victory: We got NY Bagel Café franchise ads banned from the largest franchise advertising network due to fraudulent misrepresentation and violations of their Terms of Service. Yay for us! Though it came to late to save some victims. Law enforcement and attorney generals can contact us for victims willing to share their stories and experiences. Check back for new posts being published on an ongoing basis.